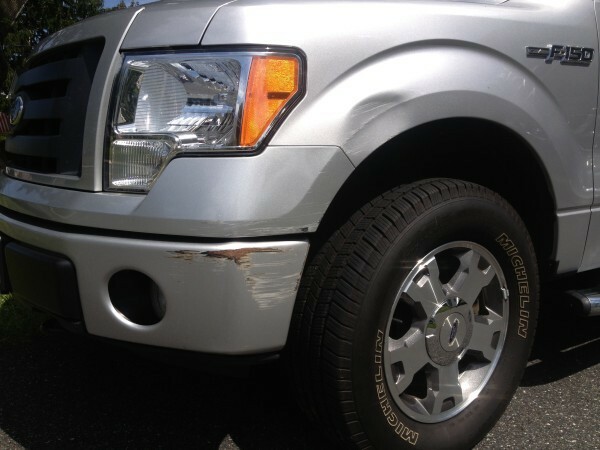 The disruption in your life after a car accident does not always end with the auto body repair process. You could possibly continue to pay for this unfortunate circumstance for several years due to an increase in your premiums, or even get dropped by your existing car insurance company the next time you need to renew your policy. One question many people have after an accident is what the long-term impact on car insurance rates will be if they file a claim. Most motorists believe that any claim, no matter the amount, will lead to an increased car insurance rate. In some cases this is actually not true. Some drivers are so worried about the repercussions of an accident, that they don’t file a claim or even notify their car insurance company of the incident. I’m one of those people. This is my truck, and it has been like this for three years. You would think that with all the body shops I work with, and our relationships with insurance companies that I would have my truck fixed by now. I’m kind of hoping that one our auto body shops will take pity on me and just fix it up, but that day hasn’t come. The truck is drivable and I am the one that caused the damage, (I backed into a huge yellow pole), so I have been reluctant to file a claim. I have spoken to body shops and I have spoken to Insurance people and I have been told conflicting information. One shop told me that any repairs under $1,500 usually will not cause an issue with car insurance rates. One body shop owner told me that his insurance company dropped him after he hit a deer and had to file a second claim in the same year. I called my insurance agent (a State Farm agent) and they told me $750 is their magic number. I also had an insurance exec tell me that anything you file will affect your rates. We are, after all, merely math equations performed by actuaries at Insurance companies, so adding in variables will alter that “risk” equation. So how do you make sense of all of this? I will attempt to here in this article. This is a quote from e-surance on their own website. In fact there are 5 areas that factor into whether your insurance rates will rise or not. When an insurance company says accident severity, they mean the dollar value of a claim, and how “serious” it was. Did you hit a car, do damage to property, or did you just back into a pole like I did. Supposedly, if you have a really long driving history with out a single blemish, your rates might not go up if it is a minor incident (see number one). Safe drivers save car insurers a lot of of money every year. A rise in rates comes when an insurance company actuary labels a driver to be higher risk. Sometimes a driver with decades of safe driving history doesn’t necessarily become high risk after a little fender bender. Your history with the insurance company is also a factor. Customer acquisition is a big expense for insurance companies (just look at how many car insurance commercials there are out there), and car insurance companies appreciate consumers who’ve stayed with them. If you’ve been with your insurer for some time with a fairly clean record, you may not see any increase after a minor incident. The key phrase here is “may not”. If you are the victim of a car accident- (you were hit by someone else), your insurer may not raise your rate. But again, the other factors will come to play, such as other claims on your account, and your driving record. If you have several tickets, and were in an accident, and you drive a lot of miles each year, your risk factor could go up, bringing your rates up with it. In that case, some driving incidences are bad news when it comes to determining fault. If you were driving recklessly, or texting, or were driving while impaired, you’ll probably see either a major increase in your rate or, possibly the cancellation of your policy. As mentioned above, car insurance companies pay out on claims when their policyholder is determined to be at fault in the collision, however there are some “no-fault” insurance states where this does not apply. In no-fault states, your insurance company is almost guaranteed to have to pay some portion of a claim, no matter who’s to blame. That means it’s more likely that your insurance rate will go up after a claim, though the above factors will still apply a little bit in determining how much it goes up. Nine of these states are considered just “No-Fault” and three are considered “Choice” states. In a so-called “Choice” state, drivers can choose a no-fault system policy or a policy based on traditional tort liability law. The tort policy used in “Choice” states are the same as those used in states without no-fault laws and, therefore, the claims procedures are the same. A driver retains her right to sue, generally without any significant statutory limitations. In today’s competitive car insurance world, many companies offer “accident forgiveness” for small insurance claims. Accident forgiveness often allows you to file one or more small claims without affecting your rates. The same will also go for glass claims. I had a windshield replaced without affecting my rates. So that does not definitively answer the question simply because there are too many variables. So if a rate goes up, how much can it go up? How insurance companies calculate policy increase amounts. Every insurance company has its own method for determining when and how much to raise your premium following an accident in which you were at fault. Some will tack on as much as 40 percent to your base policy, increasing your payments significantly. Other insurance companies will use a complicated internal points system, grouping you in a pool with other higher-risk drivers. And if you cause additional accidents, you’ll be placed in a still higher-risk pool. Many state insurance departments have also developed their own points formula, which create a standard rate structure for all policyholders within the state. But your insurance company will still ultimately decide how many points to add to your policy if you have an accident. And not all companies and states apply the formula in the same way. Points are gradually removed from your policy over a period of two to six years. What if you bump into another driver in a parking lot? Should you and the other driver settle things between the two of you and leave your insurance companies out of it? If you do decide to handle the matter privately, you’ll want to cover all your bases, this is extremely important and also slightly difficult to do, depending on the other person. It is advised to have the other driver sign a written agreement that absolves you from further liability. The agreement should also describe the accident and what both of you agree to do. If you fail to get something in writing, a dishonest driver could later claim that the accident was your fault, that you caused bodily injuries, and that you simply drove away from the scene without stopping. This is one reason why insurance companies want you to report all collisions, no matter how minor. Also if it isn’t too late, Take some photos on your camera phone at the scene or as soon as you get home. If it was a minor accident, and you covered all your bases as shown above, you might want to really consider paying for the repair out of pocket. Some takeaways from that article worth noting are that while a car insurance policy may look like a bargain initially, a high surcharge level could send your rate through the roof after an accident. So be careful of deeply discounted policies without finding out what happens in the event of an accident. Surcharges vary by state and insurance company, and some penalize you for moving violations while others focus only on “chargeable accidents” (meaning at-fault accidents for which your insurance company must pay out more than $500 or $750 per accident after your deductible has been applied). So keep in mind that not only car accidents, but driving violations can also spike your rate at renewal time. Finally, decide for yourself if the increase would still be less than the out of pocket expense. In a way you would be “financing” the repair that you might have normally paid out of pocket. If your car is severely damaged, you are probably going to have no choice but to get it fixed and deal with the insurance rate increase later. 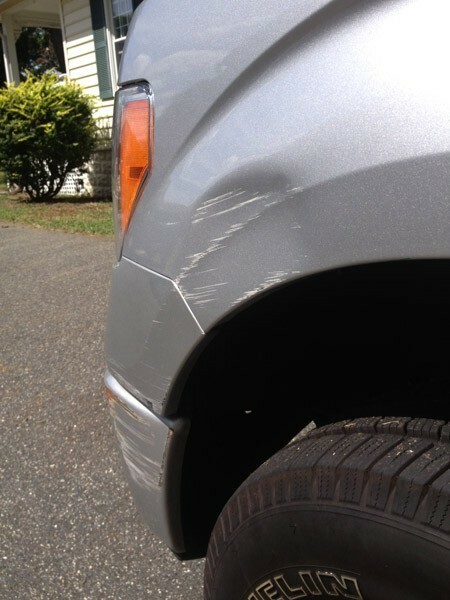 So what about my dented truck fender? I think I’m going to just let it be for now and once the truck is paid off, I’m going to get it fixed and pay out of pocket. That is of course unless one of my friend’s body shop’s are kind enough to take pity on me and fix it for me. Eli and the whole team was just great. They spoiled me putting me in the rental car. Everyday they let me know what was the progress on my car. They are receiving a cake for great service.